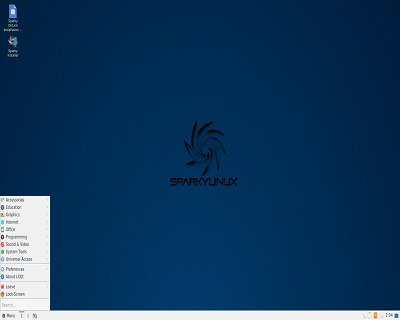 SparkyLinux 4.9 DVD (32-Bit) | Linux DVD Shop - UK Linux Shop supplying Linux on CD, DVD and USB with Free UK Delivery, 24Hr Dispatch. SparkyLinux is designed to run on both old and new computers. It is a lightweight, fast and simplified distribution and features a customised LXDE desktop. Sparky is based on and built from the branch of Debian GNU/Linux. Sparky ships with a set of selected applications, multimedia codecs and plugins and supports most wireless and mobile network cards. Package management is handled by the Synaptic graphical application, providing a nice front-end to the APT package management tools.